Handled press moulded bowl with dimpled base. Harlequin glaze to interior with clear gloss glaze to entire body. Hollowed press moulded handle to top of bowl. Which came first, the chicken or the egg? This question springs to mind when looking at some of these ramekins. Why? Because they look so much like others made by Diana or Seaton Grant back in the early 1950s. Just look at the shape of the handles. As I have said elsewhere on the Blog, design copyright was viewed somewhat more flexibly in those days. Elischer Pottery was started in Sandringham in 1947 by well-known sculptor John (Johann Wolfgang) Elischer (1st September 1891 to 24th January 1966) and his son, also named John, (real name Wolly). John (Snr) was born in Vienna and trained at the Academy of Vienna from 1908 to 1911 and was an Associate of the Royal Academy Vienna. It was reported that he won the Prix de Rome in 1909. This was a scholarship for art students, offered by a number of countries. Even though his name does not appear on any of the list of winners, he may have been awarded a second prize. This is no shame because Manet and Monet both failed to win the Prix de Rome. 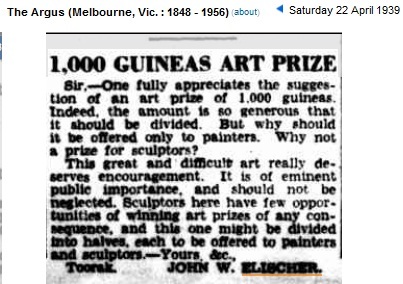 Although, their records show that there is no prizewinner listed under the painting category for 1909. Johan later studied in Paris (1910-1911) under the even more famous August Rodin. After serving with the Austro-Hungarian forces in World War 1, he practiced as a sculptor in Vienna and designed figures for Austrian porcelain factories. In 1924, he became the Art Director at Dittman-Brunner, an Austrian light fitting and novelty manufacturer. 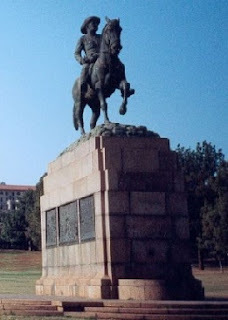 He won an international competition in 1926 to design a memorial in Pretoria, South Africa for General Botha. An excellent example of his early smaller work, the sculpture, 'Foundryman' is held in the Eckhart G. Grohmann Museum at the Milwaukee School of Engineering. This piece captures the intense concentration and skill involved in pouring metal. John migrated to Australia in mid November 1936 with his sister Edith aboard the “Orama”. 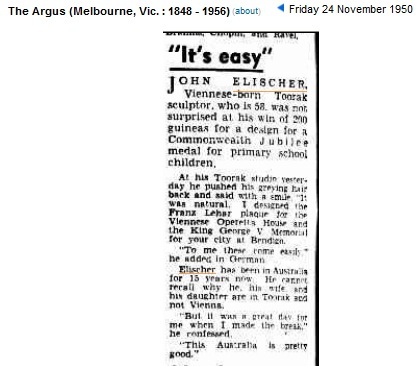 While living in Douglas Street Toorak in 1951, John won the 200 guinea prize ($420, about two months wages of the day) for a design for a jubilee medal for Australian Primary School and pre school children. There is a medal on the table with his ramekins in another post. The medal was given to the school children of Australia in 1951 to mark the fiftieth anniversary of the Federation of Australia. The design was chosen after a competition, with the valuable cash prize of two hundred guineas, won by John for his depiction of a man hand-sowing wheat. The wheat represents the seven States of Australia on the other side of the medal, at left 1901, at right 1951 in tiny letters near ground right, J.W.E. (obverse) Some of his notable sculptures are busts of Archbishop Daniel Mannix and Television great Graham Kennedy in clay. At a meeting of the University Conservatorium Old Students, in November 1937, He said; "The origin of creative art is longing. Nature has given us all the incentive to mould, form, or create in one way or another. A child at play is only employing the creative urge it feels within itself, and an artist is nothing but a big child”. 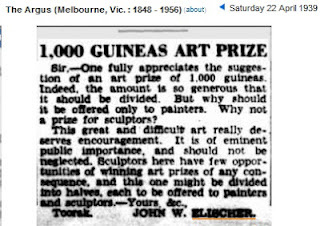 Elischer, P. Hurry and John Farmer together held an exhibition of works at the Atheaeum, Collins Street Melbourne, in June 1937. The catalogue lists 10 pieces of sculpture by 'John Wolfgang Elischer, A.R.A. (Associate of the Royal Academy) (Vienna)' (Copy in Museum Victoria History and Technology Department. 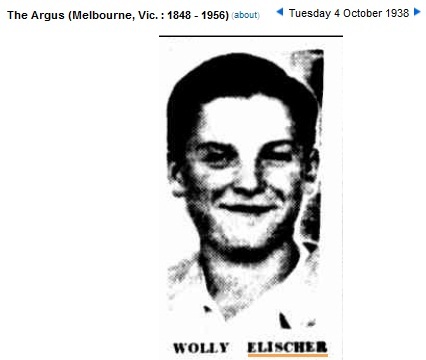 In early October 1938, John’s two sons Kurt Frederick and Hans W (Wolly) arrived in Melbourne aboard the “Oronsay”. Wolly, who spoke no English, was apprenticed to his father and studied sculpture, since, as a child he was fond of modelling. Wolly joined the Scouts, an organization he belonged to in Austria before it was banned by the Nazis. Both boys were keen athletes. 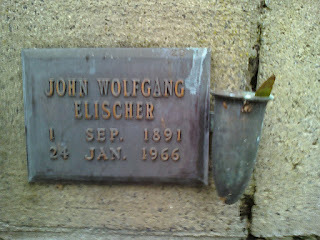 Also in 1938, his mother Anna died. She had been one of Franz Lizst's last students and was a renowned concert pianist. Elischer also received commissions for sculptures including the King George V Memorial in Bendigo (1938). 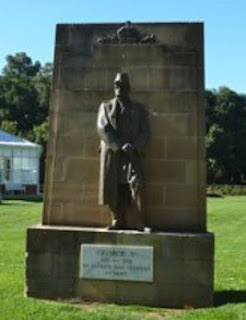 The statue was unveiled in September 1939 by the then Premier of Victoria, Mr Dunstan amidst complaints that local materials had not been used in the making of the statue.He also made a bronze fountain for businessman and philanthropist Sir Russell Grimwade in Toorak. After seven years in Australia, John applied to become a naturalized Australian in 1943. Austria, Australia, only a couple of letters different. In 1946 Huntley Pottery in Glenhuntly began making slip cast items designed by John Elischer. John (Senior) died on the 24th of January 1966 age 74 and the business was continued by his son John (Wolly), until 1987 when it was sold. Wolly died on the 9th of July 2001 age 77. Both were cremated at the Springvale Botanical Cemetery. Prior to that, at some time, Wolly started making pieces with the brand NCP. The business continues today as “Unique Ceramics” at 31 - 33 Beaumaris Parade, Highett, Victoria. You probably have some of their stuff without knowing it. Have a look at the bottom of that ceramic port bottle of beer stein from the Dandenong Octoberfest. In 2002, Elischer Street in Canberra was named in his honour. Unique Ceramics continues to use the “Elischer” brand today on some of their wares.